Located near Galle with a stunning view of the rice fields in Habaraduwa, Ivory House is a Dutch-inspired, holiday home with chic aesthetics celebrating minimal living, woodwork, and crisp interiors. Spacious bedrooms, lavish tropical gardens lush with dense foliage, an 18-metre swimming pool, and swaying palm trees make this villa the epitome of tropical living, in style. From the carved doorways, windows to breezy and air spaces, the villa is perfect for friends and family traveling to Sri Lanka. Ivory House is home to four, spacious, and well-furnished bedrooms that are air-conditioned for a cooler ambiance to ensure you are comfortable. Two of the rooms are master bedrooms and two are regular bedrooms. They are furnished with king-sized beds and the other one is furnished with queen beds. With writing desks, chairs, excellent views, and glass doors, the bedrooms are ideal sanctuaries where you can rest, breathe easy, relax on the bed, and chill. The bathrooms are fitted with either freestanding bathtubs or tropical showers under an open-air design. A rustic ambiance indoors leads to a verdant garden outdoors complete with an amazing 18-metre swimming pool fringed by palm trees for added effect. The gardens are sprawling and kids can run around, adults can do yoga or meditate, and a lot more as there is so much ground to cover. Lounge on the sun chairs beside the pool while enjoying the view of the luscious greenery. There is a pool house right behind the sun chairs, which is furnished with comfortable sofas and such. You can dine out on the alfresco dining area, amidst the natural greenery and the fresh air for a wonderful experience. The gorgeous living area at Ivory House features Pantone teal sofas that have been placed facing the excellent gardens at the villa. All-white interiors including the roof and the floor create a rustic and vintage, Dutch ambiance indoors that is immediately inviting and relaxing. The living room is minimal in its décor to savor the lightness of open spaces, breezy corners, and natural lighting that streams in from the massive, white-wooden doors. The dining area comprises a bench-style dining table for guests to enjoy a relaxing meal with friends and family. A massive kitchen with a horde of necessary amenities and appliances for your culinary aspiration is accessible and ready for use. There are stone steps leading up to the tropical gardens, right from the kitchen through wooden doors. Another dining area is found outdoors under a traditional gazebo, overlooking the verdant gardens and the swimming pool. The wonderful staff at Ivory House will go to extra lengths to ensure you have a comfortable stay with housekeeping, maintenance, and cleaning looked after. With a lavish breakfast spread each morning, start your day with a lot of energy that you will need to explore Galle. For other meals, the chef can prepare them for you, however, at additional charges. The villa is minutes away from the historical city of Galle, which you can explore on foot to view the Dutch-colonial structures, churches, mosques and other sites. It is a UNESCO world heritage site owing to its architecture and plan. You might stumble upon a hip café, restaurant, or bar, so make sure to go on foot! One of the very best villas I have stayed in in all of Asia. The villa itself was spectacular inside and out, refurbished in excellent taste. Sunil and the team were always very helpful and the food prepared was some of the best on the island. They were friendly and made the whole week that much more special. Location is about 40 minutes from centre of Galle, but the village has tuk-tuks that are only 5 mins notice away. I would definitely come here again on my next visit. Our group of 4 friends (in 3 rooms) were blown away by the villa. Having lived in Asia and traveled for some years this is the stand out best I have ever stayed in. Amazing rice paddy setting and the house was colonial yet very modern design. However, it was Suranga, Sunil and the team who were what made our stay amazing. Suranga was our host, transport organiser, cocktail maker and all round man of the day. Having worked in top hotels before mixing cocktails, he was very pleased to suggest to whip up some dark and stormies, caprioskas and moscow mules. Sunil was our 5* chef whose food was the best we had in Sri Lanka. From curry to western food, he could do everything. Make sure you get in the kitchen with him and learn how to make the 10 curries he made for us one night. This place is designed for entertaining, which was exactly what we had planned. 8 friends were staying in nearby villas and we had them over for two dinner parties. Sunil and Suranga took this in their stride and were actually excited to host. They did not disappoint and were always on standby to fill up drinks, nibbles and made the evenings a great success for 12 people. It was a little bit hard to find for guests arriving - however they do help to arrange transport and are around to help direct if needed. Only negative would be that the wifi came from two devices which constantly needed charging and though the signal was great, it meant that if you weren't next to one then you did not have wifi. This was sometimes an issue when someone took one to bed! But why do you need wifi when the villa is so good anyway! Just stayed for a week @ Ivory House. Suranga and his team; Sunil the 5* chef, Thnuja the house lady and Kelum the gardener couldn’t have made our stay any better, they delivered a 5* service in a really friendly and welcoming environment. They couldn’t do enough for you. The grounds of the house had all kinds of wildlife that were fascinating to watch; troupes’ of black monkeys would visit at various times during the day, large lizards would patrol the grass looking for meals, a family of Mongoose’s (or is that Môn geese?) would wander about the grounds, love birds and kingfishers would come and drink from the pool at dusk, woodpeckers and parrots were always busy in the trees. Then there were chipmunks, peacocks etc. etc. All right, the house isn’t close to the beach, but a must do part of being in Sri Lanka is travelling, it’s an adventure all in itself. From travelling by Tuk Tuk or by car (we had hired car + driver for the week which is well worth thinking about), getting anywhere isn’t quick but that gives you time to take in the surroundings, people, environment – everything that is Sri Lanka. When you do arrive at the beach, they are so clean and the surf is great to watch. We visited Mirrisa and Koggala beaches, both were fantastic. PS. Give the one at Galle a miss. The house itself is well designed with plenty of room. The pool is excellent, good size and more importantly was very warm!! Plenty of space around the house to wander about or just relax. You can also walk from the house to the near bye lake, about 20 minutes. 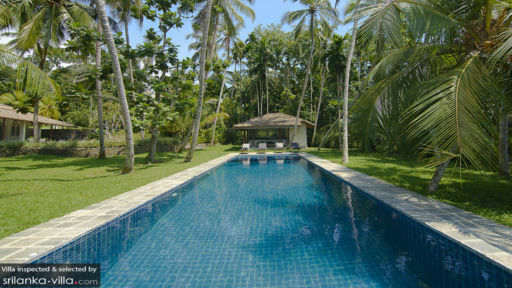 House is adjacent to paddy fields, but apart from that is pretty secluded giving an ideal location for a relaxing hol. It is with a longing look back that we left Sri Lanka and its "Ivory House". The past two weeks are something we will remember every single second of - we quite forgot where we came from! From Sunil the chef's mouth watering, exceptional cooking - which rivals any top London restaurant - to Suranga the house boy's five star service, we have been treated like royalty and can't express the gratitude we have for turning what is usually a dull and dreary January into an exotic feast for the senses. Talking of Sunil's cooking, if you have the chance to get in the kitchen with him, do! He is only too happy to teach you anything you may wish to learn about Sri Lankan cuisine; and don't be shy about asking Suranga to organise things like whale watching, a tuc tuc to the glorious, golden beaches or even a heavenly massage. Nothing is too much of an ask for him. Special thanks must go to Kelum and Thnuja - the gardner and room lady - for constantly endeavouring our stay was as seamless and paradise-like as possible. With lizards, monkeys, kingfishers and chipmunks to view in their natural habitat, "Ivory House" has been one of our most memorable holidays and though we were sad to leave, we did so happy, incredibly well rested, with full bellies and full hearts. Thank You!! What a fantastic and relaxing holiday we had. This was our first time booking a villa for holiday and visiting Sri Lanka as well.We were a party of 4 adults and 5 kids We were looked after very well, be it from our creative chef Sunil, who was ready to fulfill our every whim.He cooked different meals for the kids and us adults too . Kids loved his fish fingers and pancakes. They could eat that all day. Suranga, was very attentive and always ready to spoil the children and us too. The house and the grounds were beautiful and oh so relaxing. The kids loved the pool, the exploring in the gardens. We saw monkeys and iguanas and kingfishers all from our own comfortable villa. The only drawback is that the villa is a little ways from the beach. That reflected on times and prices of transport and also food as chef Sunil had to travel a little further to get to shops. Food was amazing and fresh and we did find it a little more pricey than what we are used to. Other than that we had amazing holidays, ate fantastic meals and had so much fun. The beaches were so clean (we could not spot any cigarette butts or other rubbish), locals were always smiling and so willing to help. we will for sure be back and recommend this to our friends. The owners of the Ivory House have created utter paradise against a backdrop of paddy fields, coconut palms, wildlife and simplistic yet stunning village life. The Ivory House is immaculately furnished and decorated in the style of the 5* Amangalla, offering spacious accommodation, peace and tranquility in luxurious style. The property is vast and so spacious, that even when full to capacity, you can still wander around without getting on top of one another or seeing another guest. The infinity pool is perfect for swimming or just lying on the shallow steps of kingfisher blue tiles to cool down from the hot sun. The staff are lovely and very friendly and the service is of a high standard. The food is delicious and a Sri Lankan omelette for breakfast is an essential kick start to any day. The Ivory House was simply the best stay I have ever experienced in a privately owned villa - outstanding. I thoroughly recommend visiting this paradise before it gets fully booked.... for ever! Ivory House is situated in a quiet lane set among paddy fields with stunning views. You really feel like you're right there in rural Sri Lanka. The property is beautiful and well appointed with very comfortable and spacious living rooms and comfortable bedrooms with en suite bathrooms and outdoor showers. The gardens are attractive and well maintained and the pool is fabulous - again with those stunning paddy field views. The staff are all very attentive but in the background and the chef makes the most delicious Sri Lankan or Western style food and seems able to be able to turn his hand to anything. Galle, with it's historic fort, and the nearby beaches are only a short tuk tuk drive away and to get back to Ivory House after a day sight-seeing is bliss. What an amazing house. Beautifully comfortable, amazing setting and wonderful staff. I can't recommend it highly enough. I'm counting down to my return trip. Fantastic house with great facilities, Sunil and his team looked after us very well, the food was always delicious combining local flavours and ingredients with an international palate. There was a relaxed feel and nothing was too much to ask. A great desire by the team to make our stay as relaxing and enjoyable as possible. Villa is a little off the beaten track so a car (or car + driver) recommended, Approx half hour drive into Galle Fort but given the high quality food in the villa we only strayed out twice in the week. We had my parents + 2 year old daughter and suited all of us, daughter loved the wildlife (monkeys/mongoose/lizards etc). Note - not easy to find on your own as tucked away so call Sunil once close to be guided in!! The house is located on the edge of a rural village... farmers work the paddy fields; dogs bark; children cry... usual village life. All beds are doubles. Galle town is 20 mins drive. A stylish house renovated with care and attention to detail located with stunning views across rice paddy fields and about 3km from the coast and gorgeous beaches. Good cook. This was my first time in Sri Lanka staying @ the Ivory house with 5 friends and we all can't wait to go back! Staff so friendly and accommodating, the chef's food amazing ..just tell him what you want and he'll do it! 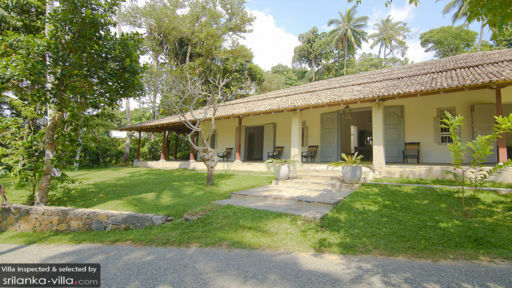 The house is so comfortable and stylish while keeping a both modern and old feel of Sri Lanka. The pool overlooking green rice fields was definitely a highlight! Great value for money and just a short drive to the beach and fort. Highly recommended .